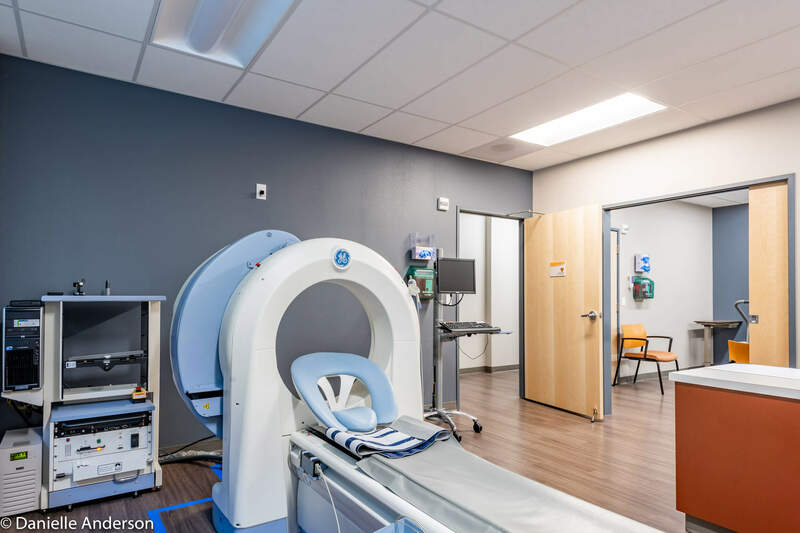 When Oregon Heart Center decided to make the move and buy a building, it was apparent upgrades were needed – STAT! For this two-story, +30,000 SF office to healthcare conversion the construction schedule of four months would be tight. The space required extensive demolition to make way for a fresh new start. 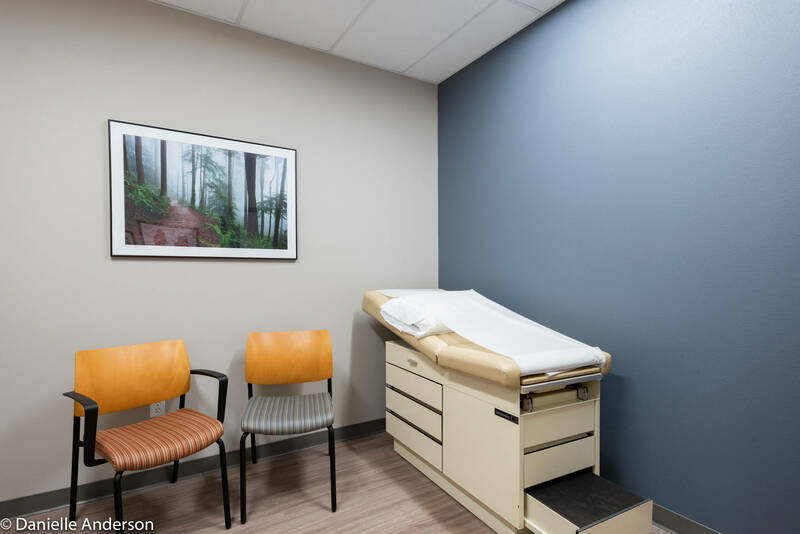 On the first floor the redesigned space offers new provider offices, waiting areas, check-in and scheduling areas and exam rooms. 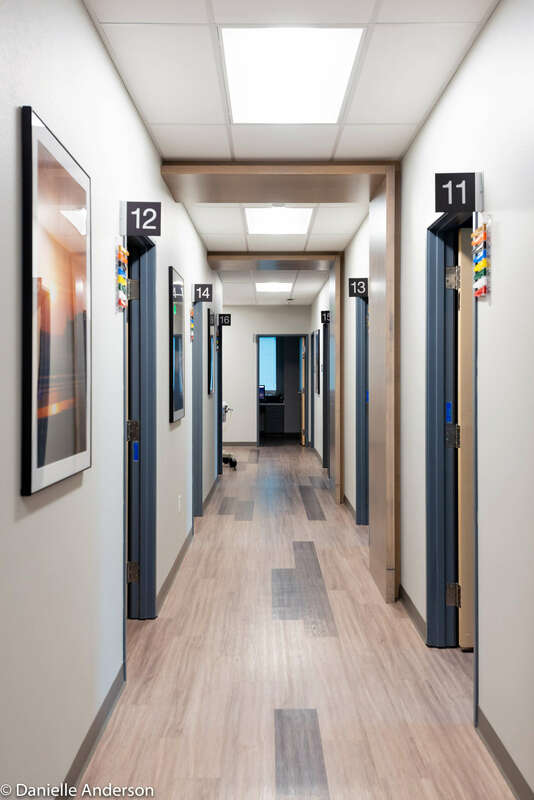 As a focused medical facility, the procedure rooms required specialized medical equipment, which required distinct consideration for placement and flow of the design – nuclear imaging equipment, extra wide doors to accommodate stretchers, and various treadmills for stress testing, just to name a few. 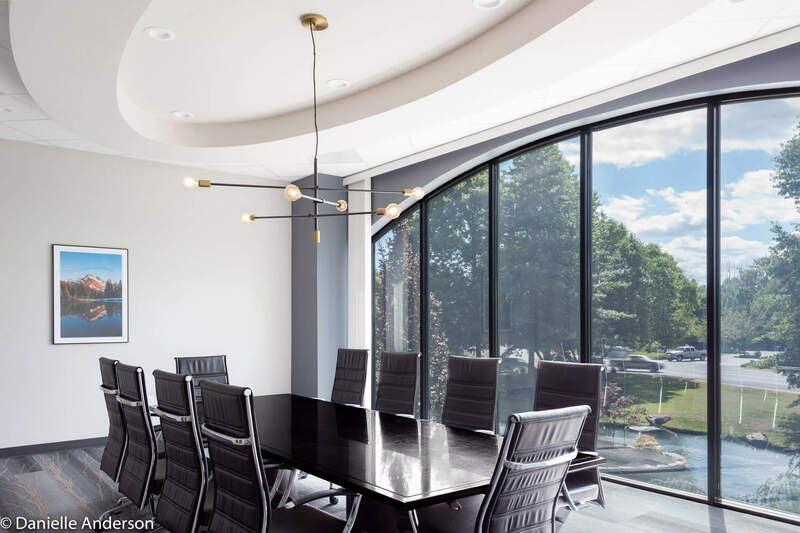 On the second floor, a new conference room takes advantage of the serene view of the pond below. The second floor also securely houses both the medical records and billing offices. 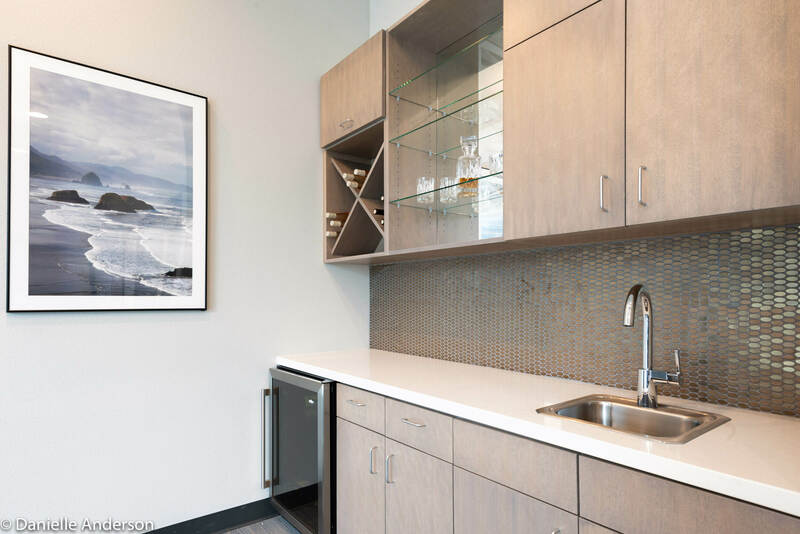 The all-staff break room offers relaxing space and the comforts of home. As an additional staff benefit, a gym was design for their use – complete with an adjacent locker room. 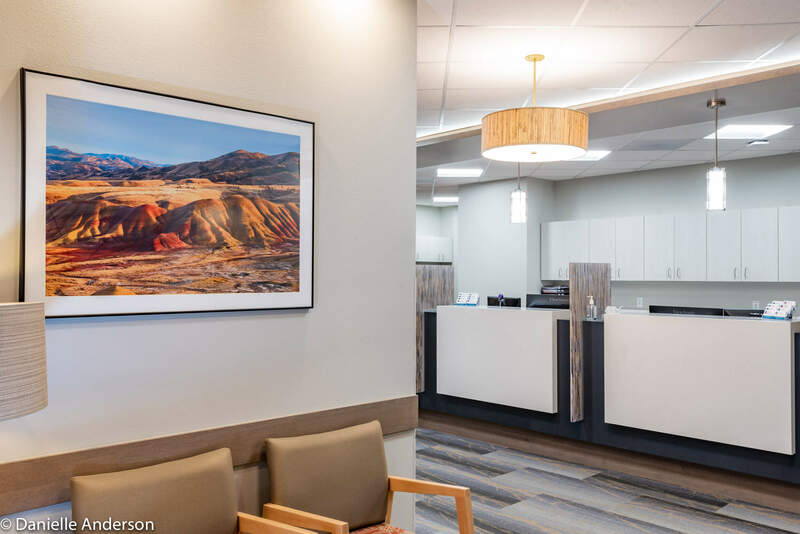 In addition, as part of a long-term business strategy, the building’s main lobby was remodeled to accommodate future multi-tenant medical office space on the second floor. 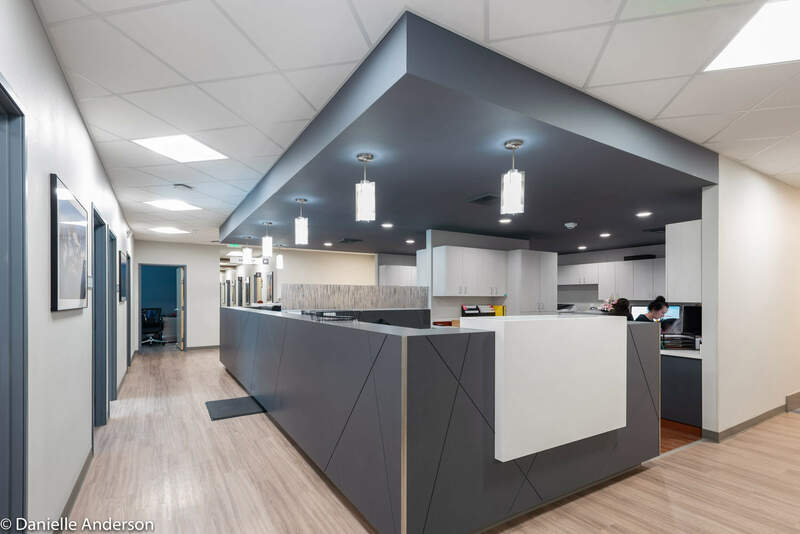 The beautifully designed medical clinic space was accomplished by closely collaborating with the client – listening to their needs, wishes and requirements. 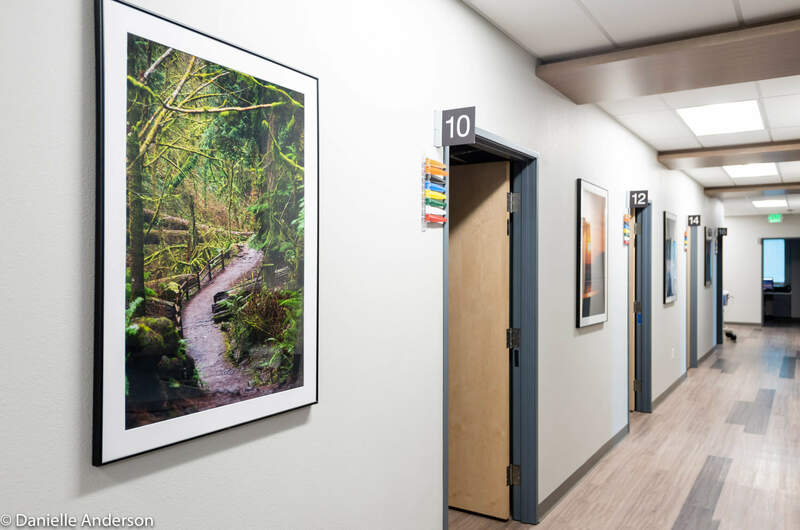 Thoughtfully appointed throughout, smart design choices of colors, textures and details help to simultaneously achieve a modern yet welcoming feel to the Oregon Heart Center. 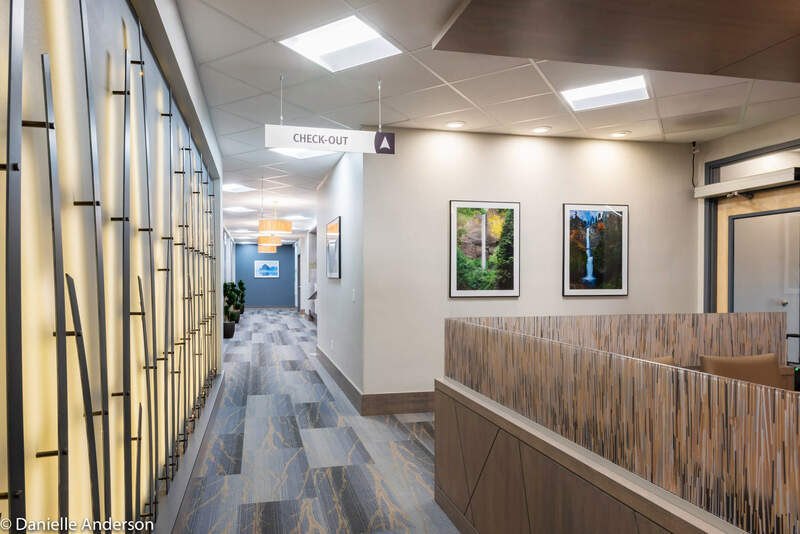 The distinctive wood wall paneling detail and architectural lighting help define the waiting, check-in and scheduling spaces throughout the clinic. 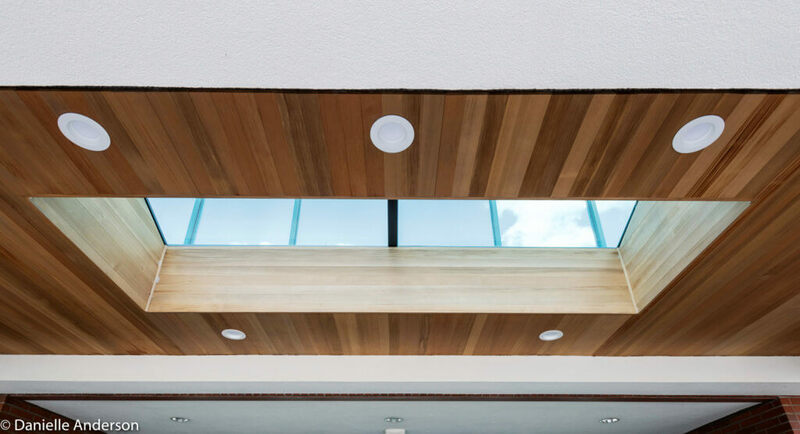 Many of the details bring in nature elements to the design. Over 70 pieces of hand-selected artwork featuring various Oregon landscapes line the walls throughout. 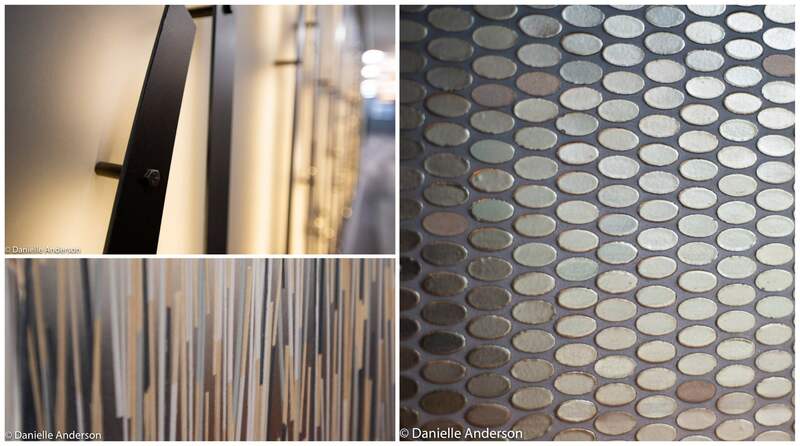 As a design element carried throughout the waiting areas, the glass partitions convey grass in natural brown hues. Another unique design feature is the 6-foot backlit metal wall art sculpture. This eye-catching feature builds upon the aesthetic with large metal blades of grass. 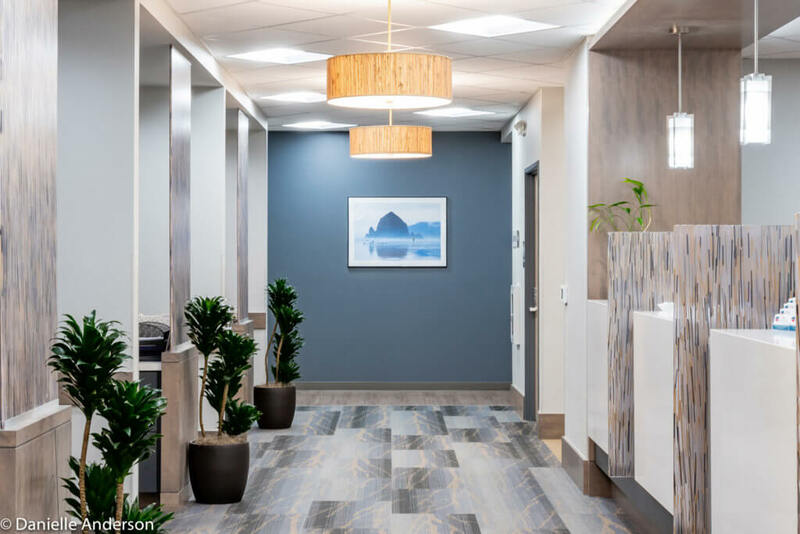 It was important to the client to convey the calming effects nature has for its patients. The site itself features a pond and walking paths – for both patients and staff to enjoy. On the outside, further site improvements were designed to improve flow to this 2.79-acre site. These included additional ADA parking stalls and new bike rack. 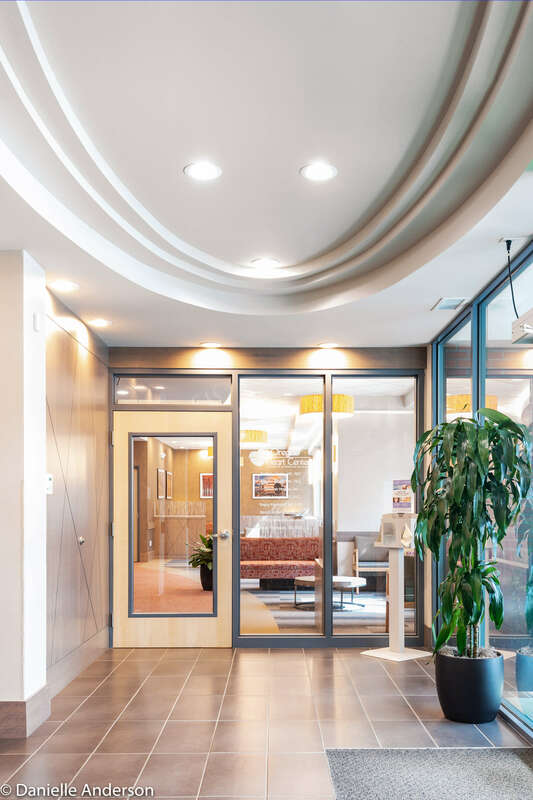 A stunning new building entry canopy was added to complement the design of the building’s exterior. 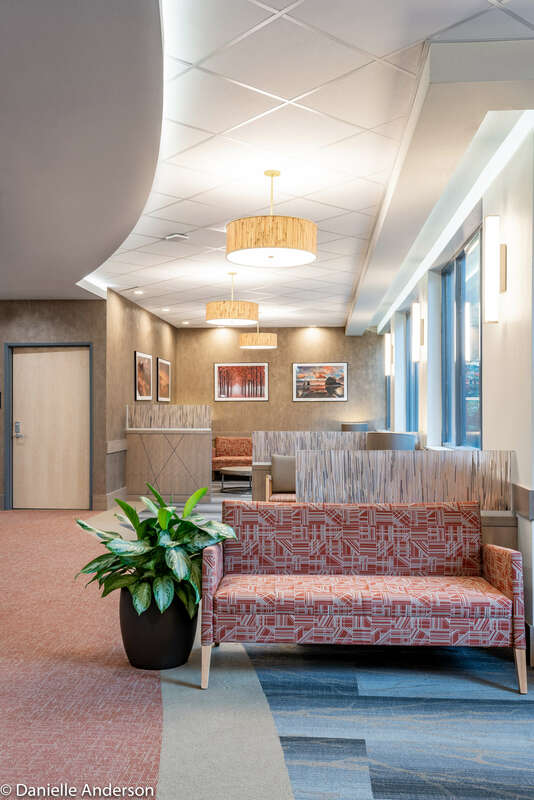 With smart architectural and interior design, Lenity beautifully transformed an outdated office building into a warm and tranquil healthcare clinic. 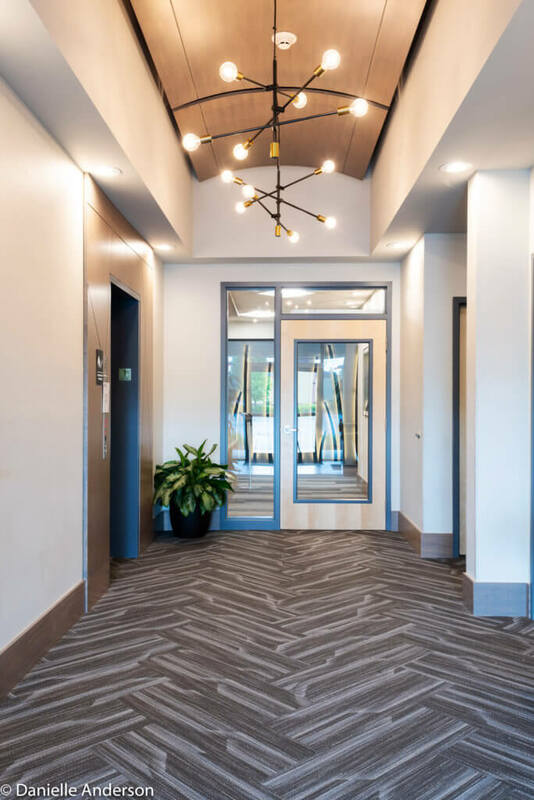 Lenity’s vast experience, expertise and long-standing relationships with both the City and construction company helped ensure the tight construction schedule was met.